A spokesman for the Nigerian President, Dr. Doyin Okupe, is optimistic that the six-week period of election extension will give the military the needed time to degrade the capabilities of the Boko Haram sect in the north-east and guarantee the safety of voters in the region during the general elections. 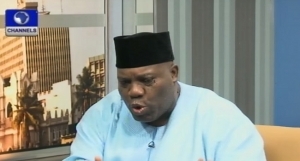 Dr Okupe made the assertion on Saturday during an interview on Channels Television’s programme, Sunrise. He was said that some developments in counter-terrorism operations in the north-east region that had seen over five years incursion of the terrorist group, the Boko Haram, would yield positive results. According to him, a military squad trained specially for counter terrorism activities had been deployed to the region to tackle the insurgents. “We have on the field special trained forces subjected to training… They are on ground. “We had problems with acquisition of arms. The army has not been adequately equipped. “That has changed because we have new equipment and machinery. We have taken possession of new arms and they are on the field. “The nature of the battle makes it difficult. The enemies are not seen. When you are sleeping they come. “We do not have a jungle army but a disciplined army. We cannot go after the militants across the borders of Nigeria. So we had to seek an agreement with the help of the AU and other international organisations. “That has been reached and all neighbouring countries agreed to form a joint force. “Before you can go to into another country, you must have the backing of international protocol. “The AU pressed the protocol that allowed other countries to join in the battle against the Boko Haram. That gave neighbouring counties needed rights to contribute to the fight against the sect,” he said. According to him, about 7,500 soldiers are expected from the African Union. He emphasised that the demand for a six-week extension by the military did not mean that the insurgents would be wiped out, “but that it would afford the security operatives needed time for collaborative efforts” in securing the north-east region before the elections. “Within the six weeks, the military would have degraded their capabilities to enable people in the north-east take part in the elections,” he said. Another guest on the programme, a former Minority Leader of the House of Representatives, Mr Arigbe Osula, blamed the government for the inability of the Independent National Electoral Commission (INEC) to conduct the elections on the earlier scheduled date, saying that the government had all the time needed to address insecurity in the north-east before the election date. But Dr Okupe dismissed his claims saying that the government should not be blamed for the inadequacies of the INEC. He further stressed that the presidency, after the INEC briefed the Council of State, asked the INEC to consider extension of the election date to enable more voters collect their Permanent Voter Cards.